There's an old saying that a great jazz musician never plays a song the same way once. That could certainly be said of Jerry Bergonzi. He is an intellectual artist of uncompromising integrity and a bold, original composer. On Jerry's new Savant recording he returns to the organ-tenor trio format after a long hiatus from it. From the opening track, Cy Coleman's "Witchcraft" with its hypnotic organ vamp and "bewitching" chord substitutions Jerry gives to the first 8 bars, you know this isn't going to be your parents' organ-tenor gig. 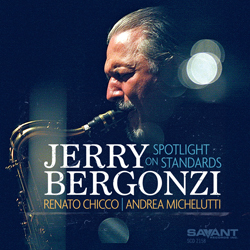 Bergonzi and his discmates, Renato Chicco on organ and Andrea Michelutti on drums, take these standards down new harmonic paths and use them as a launching pad for fertile and impressive improvisation. The playing is always intense and distinctive, fresh and spontaneous.